This is my Obama mug. I bought it almost exactly 8 years ago today. It's an official Obama/Biden Inaugural mug. When I bought it, it had a gold seal on it commemorating the 2008 inauguration. I was in DC with a ticket to the ceremony, and to the Ball. I thought it was cool. Unfortunately, it didn't take long for the shiny gold to wear off - someone put it through the dishwasher, and the mug lost it's sparkle. It became just another mug. But over time, I came to see that it was NOT just another mug. Did you ever buy something and find that it is just... quality? Somehow better made than other items in its category? A wool coat that's just warmer and yet softer and yet more sturdy than others you have owned? A particular pen that just flows its ink more elegantly than any other? This mug was like that. The mug was heavy in the hand. Thick and pleasant to drink out of. Just the right size for the right amount of coffee. 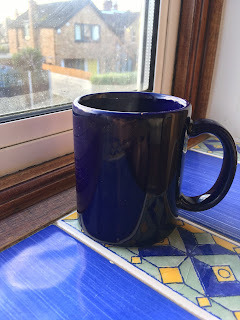 Shorn of its shiny gold trappings, it got on with the job of being a mug and it did so exceptionally well. It became my favorite mug. I drank from it almost every day of my life, and almost every day of my life it made me subtly happier. I had good days in that time. And I had bad days in that time. The mug didn't solve all my problems. I didn't expect it to. But, by God it is a good mug. Fortunately, mugs are not subject to term limits, so hopefully I will be able to drink from my mug for many years to come.